Hearts to the Rescue: NYC, NY: MAY BE TOO LATE. Beautiful, VERY friendly 15yo Orange Tabby...Owner Dumped! NYC, NY: MAY BE TOO LATE. Beautiful, VERY friendly 15yo Orange Tabby...Owner Dumped! 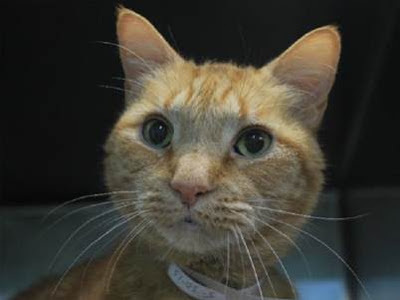 A volunteer writes: Carmen who should be named Carmello is a lovely talkative senior lonely in his cage after being surrendered by his owner. He accepts gentle petting while talking to you about his fretful situation " How can this happen to me after all these years?" he complains. Why not make this sweet gentleman's remaining years happier for him and for you!